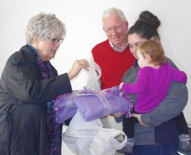 The volunteers with Clinton County Habitat for Humanity celebrated their second home dedication last Saturday, December 6. Jaime and Brandon Wipperman, along with their 18 month old daughter Zoey, gratefully accepted the group’s support and recognition of their journey to a brand new home. Each Clinton County home partner is expected to repay the cost of building their home. Through the savings of volunteer builders and donated materials, three-bedroom homes cost approximately $55,000. Each homeowner repays their no interest mortgage at a rate that meets their budget. For many families, this is the opportunity that ensures they will have an affordable home that will stand the test of time. Later on Saturday, the group rededicated another home in Wilmington for Alicia Robinson and her two children Aiveon and Mya. The home became available this summer and the group wanted to find a family that would “pay it forward” for the next Habitat family—support the group’s activities, become a volunteer and make their monthly payments.